Given the high cost of senior care, more and more people are faced with the situation where a parent is moving in with them. This is a reasonable alternative to private-pay assisted living, which can be very expensive. And usually what comes with Mom or Dad is a need for bathroom remodeling! It just makes sense – your parents, being older, have special needs. Meeting these needs with your remodeling will let them enjoy their time with you and keep them safe, too. There are lots of considerations to think about when planning a remodeling job for seniors, but here are five that should be considered first. Think these things through with the person who’s going to be using the bathroom; in fact, get their feedback and make them part of the design process. In doing so, you’ll lift their spirits and find out what’s most important to them. Consider installing a walk-in bathtub. Getting into a shower can be difficult and even dangerous for those with poor balance. Seniors find it hard to step over the side of the tub. A walk-in tub eliminates this problem. It might make sense, too, to get a seat for the shower. Your Mom or Dad will thank you! Install handrails near the toilet and in the shower. Well-placed handrails or grab bars can provide the leverage seniors need to help them stand up. 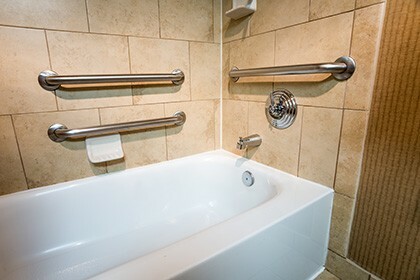 Shower grab bars offer cost-effective extra protection against falls in the bathroom. Install a taller toilet. This is an item of comfort and convenience and the difference in cost is negligable. It’s easier to use a raised toilet than a conventional one, and seniors appreciate the convenience provided from just a couple extra inches of height. If your loved one is in a wheelchair, consider customizing the sink and hanging it lower for easier access. Some sinks have enough room to partially pull a wheelchair under the sink, which is particularly helpful. Also, check the height of towel bars, too. You want to make sure that everything your parents need is easily accessible to them. Lastly, try to provide plenty of natural light. If it’s possible to install a skylight, go ahead and get this done. Natural light lifts one’s mood and can influence how the day is perceived. If you need to lower a light switch, do so, but always make sure you’re within the electrical code specified for where you live. Admittedly, bathroom remodeling can be costly, but consider the high cost of assisted-living care, which typically costs several thousand dollars a month and rarely have that warm “at home” feeling. Giving Mom or Dad a safe place in your home gives them more pleasure and satisfaction. If you’d like to learn more about bathroom remodeling options, give The Remodeling Source a call. This is a division of The Plumbing Source staffed by our own experienced remodelers who’ve been doing kitchens, bathrooms and basements for years. 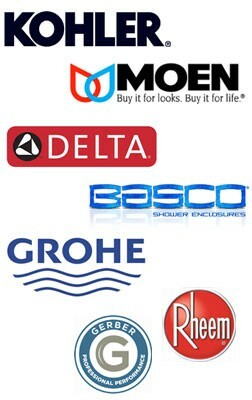 Be sure to ask about our bathliner products that can be installed in as little as one day! You’ll save money when your plumbing and remodeling needs can be handled by one company instead of two independent contractors. We’ve got the expertise to complete the job professionally and to your complete satisfaction. That’s why we say, When you call The Plumbing Source, you’ve made the RIGHT call!